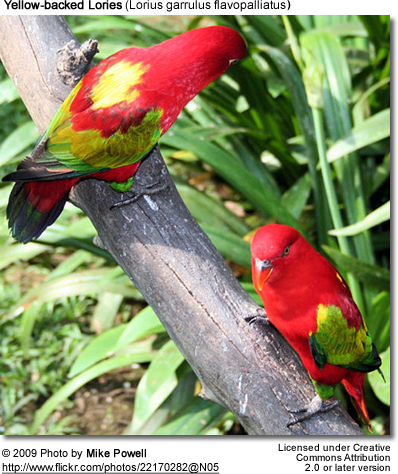 The Chattering Lory (Lorius garrulus garrulus) is endemic to the Halmahera and Weda Islands (part of the Maluku group of islands). 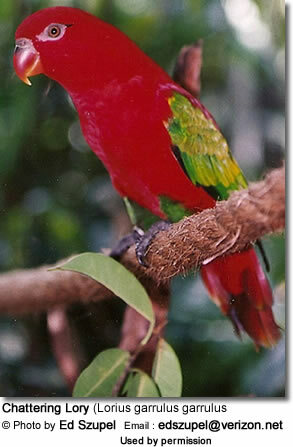 This lory is endangered in its natural habitat due to habitat loss (Cites II). They average 12" (30cm) in length and weigh about 6.7 - 7.9 oz (~190 - 225 g). The plumage is mostly dark dark red except for the wings and thighs which are green. These are amongst the better talking species and perhaps one of the cleverest at escaping. They are known for their great personalities and are known to always be up to something. If something is placed on top of their cages, they will work endlessly until it's knocked to the floor. Food and water bowls must be firmly attached to the cage, and even then they will likely become toys! There is a sub-species, the Yellow-backed Lory, L. g. flavopalliatus, which has a patch of yellow on the mantle (back). - Owner of Cuttlebone Plus and Expert Breeder / Keeper of Lories). Description: At about 30 cm or 12 inches in length, it's about the same size as the nominate species featured on this page. They look like the Yellow-backed Lory, except the yellow patch to the mantle (back) is smaller and less extensive.